A Soul in Exile: It’s a Jihad – stupid!!! It’s a Jihad – stupid!!! Enough has been said, written and tweeted about Arundhati Roy’s brain-dead comments on Kashmir, twisting of history of Kashmir and her right to free speech. I respect her right to free speech – after all right to stay stupid should be a right too. Though I strongly detest her attempt to dismiss the trauma of Kashmiri Pandit’s in exile by denying the ethnic cleansing and exodus ever happened, she has a right to stay in darkness. 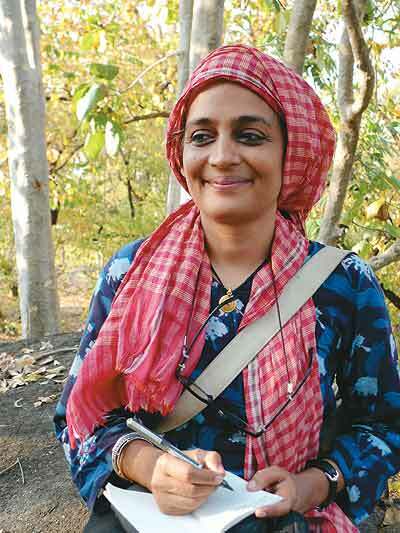 She is afterall a friend and comrade of people like Gautam Navlakha. She can go about repeating whatever she has been tutored on freely; hope it helps her sell one more novel and get more paid trips on lecture tours. Freedom of speech is paramount – so what those exercising their freedom of speech to question and critique her logic and opinion are being shouted down. But this post isn’t about Arun-dirty… she would have probably moved on to another headline issue by now already… or some Page3 parties around her luxurious South Delhi home. 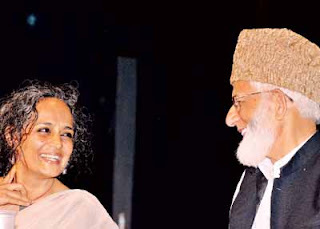 In Delhi and then in Srinagar, Arundhati was espousing the cause of one Syed Ali Shah Geelani – the grand old hawk of Kashmir… and pouting prose in support of his ideals and ideology that he espouses. Supporting the Azadi bridgade… on the notion of a separate identity and want of freedom from a colonizer. Geelani says what we Kashmiri Pandits have been saying for decades already… we of course, said this earlier because we have lived in the midst and known the psyche that led to it. Kashmir – is not a political problem. Kashmir problem is not about ethnic identity, not about right of self-determination, promises of plebiscite, not about rigged elections of 1987, not about failed accords or lack of those, not about article 370 or autonomy. Kashmir is a religious problem. The issue is simple and straight – its religion. It’s about Islam and the urge to join the larger Ummah’… the greater Islamic brotherhood. And Geelani minces no words when he says clearly that. And I respect him for being forth-right – compared to all others in the valley and Hurriyat, who continue to dodge around the truth. Geelani wants Kashmir to become a true Islamic state. A model Islamic state. Minorities and so-called Kashmiriyat be damned. But don’t worry, he too would surely add a customary footnote of “we want our Pandit bretheren back” etc. No wonder – how can you apply Islamic laws like these, if there are no minorities to butcher. Geelani abhors the concept of “Secularism” – and decries its imposition in Kashmir. No wonder Arundhati upholds his ideals. Wonder why Arundhati – the citizen of mobile republic – doesn’t take citizenship of Islamic State of Pakistan or the middle eastern world. She can enjoy real freedom right away. Kashmir has been invaded by Wahabi Sunnism – Kashmir problem will remain till there is a pan-Islamic trauma world over. There can never be a solution to Kashmir till there is a failed Islamic state next door or rogue petro-funded jihad mongers in the region. Kashmiri Pandits have known this for decades. Told you so – when we kept saying that “Kashmiriyat is a hoax”. It was only reiterated to us - when we were hounded out to religious frenzy in 1990. It was evident when hell broke loose in Kashmir over mere use of transit facilities for a Hindu Pilgrimage . Its been evident in the rapid Talibanisation of Kashmir over last few decades… And that’s one reason why its only the Kashmiri Sunni Muslims’ who believe in this Jihad in Kashmir. All others know what fate lies ahead for them in an Islamic state of Kashmir… if the state of minorities, Shia’s, Ahmadiyyas etc in Pakistan is taken as an example. But of course, Arundhati is a writer/speaker. Which means she only writes and speaks. Never reads or listens – what her co-speakers like Geelani really think and say. I still uphold her right of not reading the truth. Her right of staying stupid. Keep writing. Expose these people. Exhibit your writing especially in the western world. You may also like to view my views on the problems in Kashmir @ Get Well Soon Arundhati Roy . One more brilliant article. Well Ms. Roy has nothing but pity to offer as clearly doesn't have the intelligence! In her speech she wrote that she speaks also for the Kashmiri Pandits who were forced out of their own homeland, just forgets to mention who forced them. It was certainly not the Indian state. What I fail to understand is the motivation that drives people in the valley to demand to be a state like Pakistan or Afghanistan, or Iran, or Iraq?? Or do people really think the idea of an independent state is really a feasibility when countries like Pakistan, India and China surround you and lay claim on the land? Wouldnt agree with you more.. Good job..